Born in Dallas, TX and raised in McAllen, TX, Jose Paez is an always active and determined type-A character. 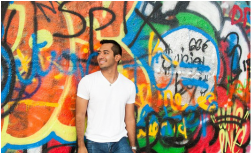 Having graduated from Texas State University, Jose is now a volunteer for Kids In A New Groove, where he's a mentor who teaches guitar classes to foster children. He's also the Co-Founder and Director of Genius Operations here at Global Genius Society and owns his own marketing and event management company. Find him hanging out on rooftops across Austin and throwing around an unwarranted amount of high-fives.